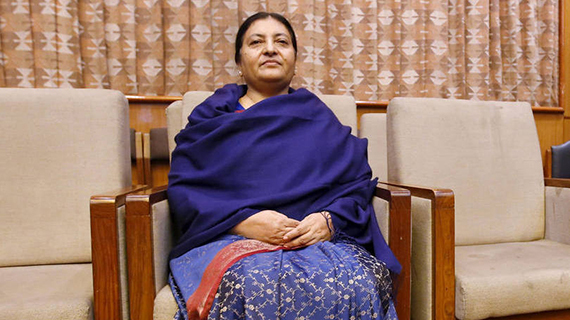 Kathmandu, July 31: President Bidya Devi Bhandari today made a verbal call for the formation of a consensus government. The President made the request for a consensus government in her conservations with senior leaders of major political parties including outgoing Prime Minister KP Sharma Oli, Nepali Congress President Sher Bahadur Deuba and CPN (Maoist Centre) Chairperson Pushpa Kamal Dahal at her residence in Shital Niwas. Jibachha Sah, Personal Secretary to the President, who looks after public relations, said that the President urged the political leaders to make more effort for a consensus government. The political leaders also including Chairman of the Rastriya Prajatantra Party Nepal Kamal Thapa and Chairman of the Madhesi Janadhikar Forum Nepal (Loktantrik) Bijaya Kumar Gachchhadar reached Shital Niwas to discuss forming a majority government as the deadline for a consensus government is expiring today. In the meeting, the leaders apprised the President of the efforts they were making until the last minute to form a consensus government, said Sah. They also requested the President to begin the process to form a majority government with the deadline for a unity government expiring today, he said. He said that there is likelihood that the President on Monday would give the political leaders a week's timeframe to form a majority government. Talking to media persons after the meeting, NC President Deuba said that they requested the President to initiate the process for a majority government after a failure to form a unity government within the set deadline for the same.